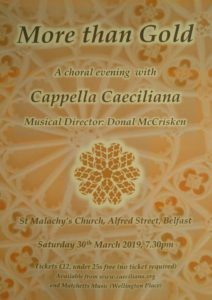 Performance History: Written for the Capella Caeciliana Choir, two performances scheduled, one in St. Malachy’s Belfast on March 30th 2019 and the other to be confirmed. This work has also been chosen as suggested repertoire for the London Festival of Contemporary Church Music in May 2019. About: A short setting of Psalm 19, where the Psalmist ponders the preciousness of God’s Word in comparison to what has monetary and aesthetic value (gold) and what brings sweetness and sustenance (honey).